The JSB is a forum for young string players. 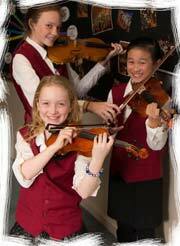 Its aim is to build and refine orchestral performance skills in a fun, learning environment. Professional educators are employed as the conductor and string tutors. A varied repertoire of classical, popular and original compositions and arrangements are used. Works are carefully chosen and designed to help further technical development and ensemble skills. Player’s standard is AMEB Grade 1-5 (or equivalent). attention to the learning and refinement of orchestral performance skills. 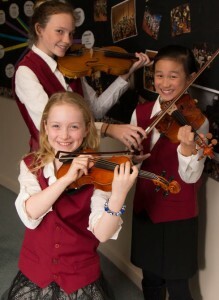 Junior Strings of Banyule is the most junior of the four ensembles which comprise the Heidelberg Orchestras Inc (HOI). HOI grew out of an original orchestral forum named Heidelberg Youth Orchestra, which was founded in 1978 by Alma Robertson, a Heidelberg violin teacher. 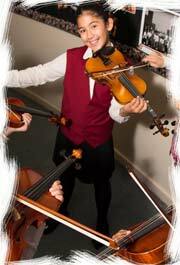 Since that time, the RYO has evolved into an ensemble for intermediate level orchestral players whilst the JSB enables young string players to develop and acquire essential orchestral and music performance skills. The HSO caters for individuals of advanced standard. Sonia Rogers is currently the Head of Strings at Lowther Hall Anglican Grammar School in Essendon. She studied violin at the Victorian College of the Arts and graduated with a Diploma of Arts in Music. She then completed a Bachelor of Education (Music) at The University of Melbourne as well as a Graduate Diploma in Education Administration. Sonia is an AMEB Violin Examiner and has been a conductor and tutor at several State Music Camps and Melbourne Youth Music Summer Camps. 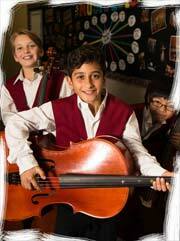 Sonia has been the conductor of the Junior Strings of Banyule since its inception in 1995. A weekend music camp or a workshop (with another orchestral group) is held once a year. Players are invited to participate in other opportunities when they arise e.g. Carols on the Ivanhoe Boulevard at Christmas time. JSB is managed by Heidelberg Orchestras Inc (HOI) , a non- profit organization. The Board of Management of HOI includes parent representatives from the JSB in addition to the standard officers required. JSB rehearses every Wednesday during school term in the St James Parish Centre, Upper Heidelberg Road, Ivanhoe from 5.00 to 6.30pm. Simply call the Orchestra Manager, Diana Maxwell on 0418 149 189 for more information or to visit a rehearsal. Or download membership form here.